Morning Reflection: He is an everyday kind of love. Grow in intimacy with God. I love gathering with other believers to celebrate Jesus and love the Body of Christ. Yet following Jesus is more than going to a building on the weekend. Following Jesus is being with God Monday through Sunday, chatting with Him daily, communion with God, intimacy with God, hearing His heartbeat, responding to His incredible love. It is a habitation not a visitation, immersion in His glory, partnership with God, being a conduit of His love and power in a dark world. The Gospel is not a me centered story or a church centered story. It is God’s story. He is the Author, Finisher of our faith. Jesus is central in the Gospel. Following Jesus moves far beyond activity into profound intimacy (knowing God, being with God, and being known by God). Activity will never surpass friendship and sonship. God is after heart, why we do what we do. 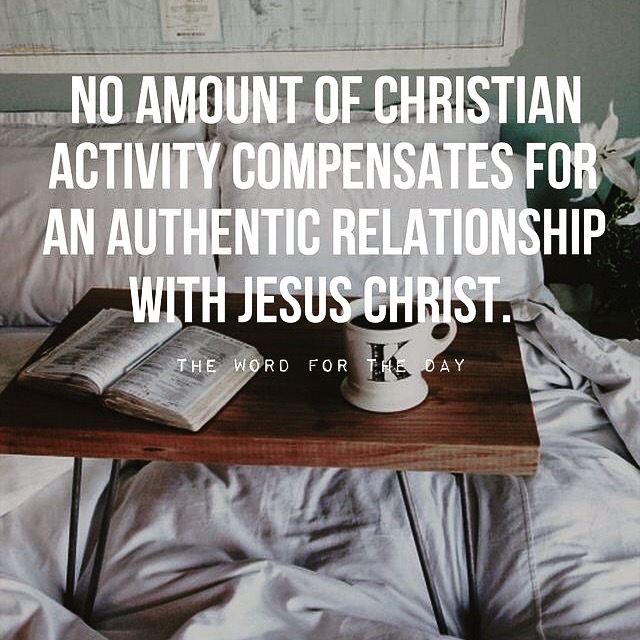 He is more interested in connection and relationship than our busyness to try to please Him. Being with God is far more important than doing for God. Being leads to doing with the proper motive and the grace to accomplish the activity. Being with God is not about laziness or passivity. It is about love. Love seeks to give. We surrender all of who we are to all of who He is. He does the same. Can we simply sit for a moment each day and love the One who loves us most? If we are driven by activity instead of intimacy and abiding with God, our source is flesh. Only what flows through His Spirit is pure. Apart from God there is not abundant good fruit (John 15:4-5). May you and I continually invest in knowing God for who He is and not the God made in our own image. May we pursue Him for who He is, not for what He has to offer. May we surrender and worship because He is worthy, not so He can bless us. God is good. He is worthy of it all. In every season may we dive deeper into God’s love, and get to know Him. God bless you! You are SOooooo deeply loved.